The first meeting of the year saw over sixty visitors join members for the presentation entitled “Remembering the High Street”. The subject obviously struck a chord with many Melksham people. The scenes were mostly from the 50’s onwards, within the memory of the audience with a sprinkling of very early 20th century just for pure pleasure. 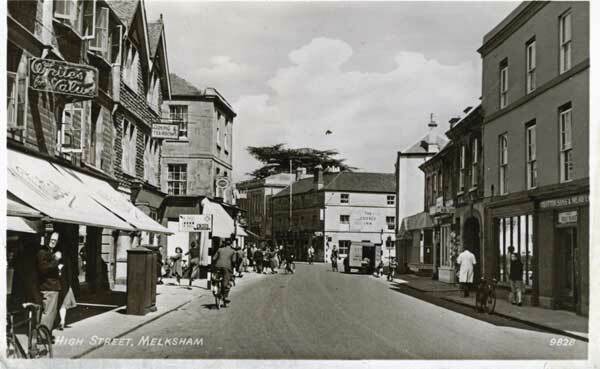 So many shops have come and gone over the years so this was a golden opportunity to remind us all of just what a busy little town Melksham has been. Names like The International, first in the Market Place and then the High Street. Smiths on the corner of Church Street, The National Trust Shop and Edmund’s in Church Street. There were several Co-op shops through the years in Church Street, Lowbourne, Bank Street and Bath Road, sadly all names from the past. However Tony did draw attention the faithful few that have been around for fifty years and more, The Samovar once in Canon Square now in King Street. Newman’s the butcher still in Church Street, Marjo in Lowbourne and S & N News now just in Church Street but at one time also in Bath Road. The Toy Shop in Bank Street and of course Gompels. There has been a chemist on part of their site for over 100 years. Thanks to Tony Seager we were also able to include photos of “Fishy Parks” standing in the doorway of his shop in Church Street, Nelson Cole in front of his photographic shop and Nicky in the doorway of the Cobbler’s Bench both in Bath Road and finally one of his father in front of his hairdressers shop Boddington’s also in Bath Road. With a successful evening like that under his belt one wonders what theme Tony Fivash will dream up for 2020! Our next meeting will be on Thursday 21st February and is “A step back in time …..” a virtual tour of Castle Combe given by Carly Batten. Visitors welcome £3.